The seismic traverse had originated at Komsomolskaya (335 miles north of Vostok) on 6 November 1959, using five tractors and ten towed sledges for the first leg. 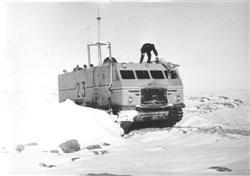 The Vostok-South Pole trip, 800 miles each way, used 3 large tractors and 4 sledges. 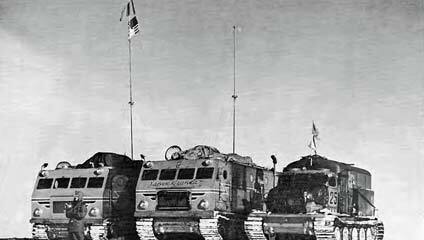 The first two vehicles seen here are heavy 35-ton Kharkovchanka (Russian Харьковчанка, "snow tractor," or perhaps "chunky vehicle built in Kharkov!?") 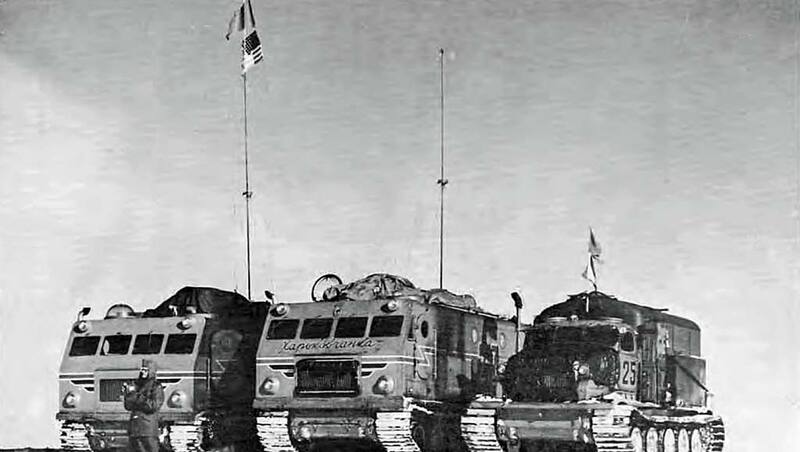 machines which had been adapted from the T-54 tank, while the third vehicle is an "AT-T" (Artillerlyskiy Tyagach Tyazholly, Russian ртиллерийский Тягач, Тяжёлый meaning "heavy artillery tractor," also adapted from the T-54 tank). were the second generation of Russian heavy traverse vehicles, designed for the annual inland station resupply trips. They had been delivered to Mirny and driven to Komsomolskaya the previous summer. 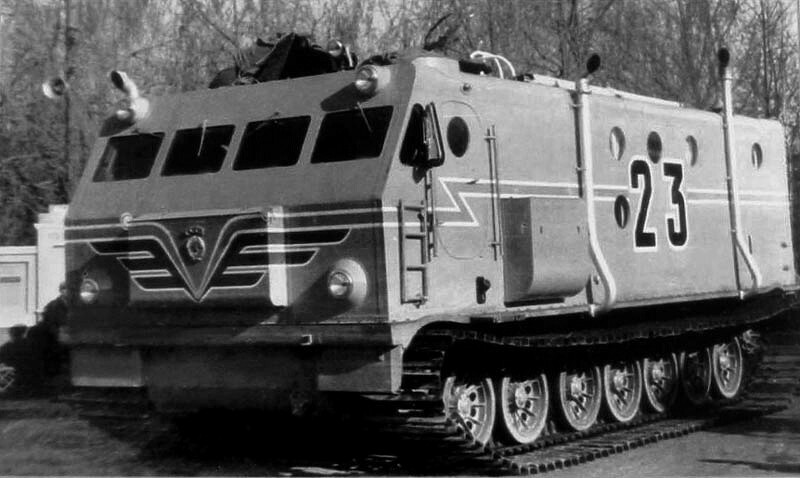 Powered by 520-hp V-12 diesel engines, they were truly huge and heavy--14 feet wide and over 30 feet long...but the engine could power them to speeds up to 20 mph. The cab could seat at least six people; the rear of the hermetically sealed body was divided into multiple compartments--perhaps a bunkroom for 10 people, along with galley, head, office and comms rooms. Below are two additional photos of #23, the second vehicle in the lineup above. The one at left was taken at the Malyshev factory in the Ukraine before shipment (source: the photo was downloaded from the factory web site in 2004, the photo/link no longer exists). The photograph at right was taken by Vladimir Evseev at Mirny in 1965. Source and credit: the Russian Arctic and Antarctic Research Institute (AARI) (the photo pages are in this old frame). Note the size of the vehicle relative to the man on the roof! (More details and photos of the Kharkovchanka tractors can be found on the second half of this Russian language site--interestingly, the first half of the page deals with the Snow Cruiser that was at Little America III in 1939). After arriving at Vostok on 29 November, the equipment for the trip to Pole was selected and serviced. 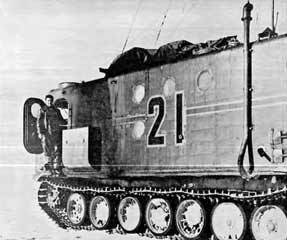 The 16-man team, led by Alexander G. Dralkin, left Vostok on 8 December. They stopped for seismic readings every 125 miles and arrived at Pole on 26 December. Upon arrival they asked to see a Western, so they were shown Hondo starring John Wayne. In addition to their seismic work at Pole, they also drove their vehicles "around the world" (circling the ring of 55-gallon drums) in 15 minutes, for which they were given special certificates. The group departed on the 29th and reached Vostok on 8 January, from where the party was flown out to Mirny. One of the vehicle drivers steps out upon arrival. The traverse vehicles parked at Pole.